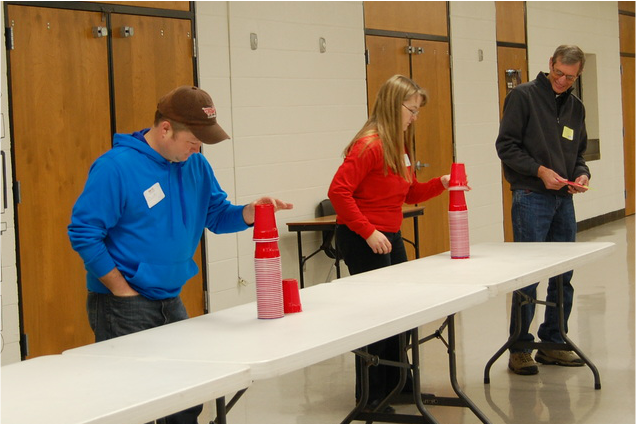 Above, Dusty Reed (left) and Beth Hudson (middle) compete in one of the trivia night’s games while Landon Fletcher (right) judges. It is the time of year for the Cassville Education Fund’s annual trivia night. Each year, the Cassville Education Fund (CEF) Board hosts a trivia night for community teams to raise money to add to their endowment fund that provides grants for Cassville teachers for various programs. The CEF was established in 2009 when members of the community handed together to accept a fundraising challenge from Harry Cooper Supply Company. The group was charged with raising $20,000, and if that goal was met, Harry Cooper Supply would give a $10,000 matching grant. That year, the board started the fund with even more than they anticipated. The first year, $35,000 was put into the fund, and it has grown each year since then. Today, the CEF has over $50,000 in the account which is overseen by the Cassville Community Foundation (CCF). When the Board began fundraising seven years ago, they sought donations from area businesses and individuals, as well as alumni who helped get the fund established. On average, donations of $20 to $120 keep the fund going. Some of those donations are made in memory of CHS alumni, as well. Mary Cupps, board member for the CEF and CCF, said that area businesses have reliably supported the fund since its inception. Fundraisers that the board has hosted in the past to help raise money included a poker run, an alumni class challenge, a Homecoming luncheon and a golf tournament. Cupps said that the school also supports the fund with a dress down day and a potato bake. Teams of up to eight people compete in trivia rounds, as well as games for points to be crowned the trivia champion each year. Teams are supported by a variety of groups and businesses, including local banks, businesses, Crowder College, book club teams, librarians and more. By charging teams to participate, as well as offering food during the event, the board is able to raise money for the endowment. Cupps said that the Board is also looking at a new opportunity for fundraising this year, as well. The CCF is a part of the larger Community Foundation of the Ozarks. The CEF is one of 20 non-profits that has been selected to participate in a 1:1 match of up to $5,000 through the Cause Momentum fundraising initiative. Cupps said, “Each year, we can fund only a few of the grant applications that we receive because we can only give out money from the income of the fund. As the fund grows, we can award more grants.” More details about that fundraising effort will be available at a later date. Each year in March or April, every Cassville R-IV teacher receives a grant application from the CEF. Teachers can apply for grants individually or in a group as long as the program they are requesting support for is an academic program that enhances student learning and development. The CEF committee reviews the grants and makes suggestions to the CCF, that makes the final decision about who receives the grant funds each year. In the past, the fund has supported a Smart Board interactive reading and math software for first grade, various books and games, Fitnessgram software for the Physical Education program, Handwriting without Tears for first graders and math programs. Teachers from each of the buildings have earned grants for the programs. Grants are announced each year in May at the teachers’ meeting. The Cassville Education Fund is operated by a volunteer board that includes anyone interested in the initiative. This year’s board is comprised of Mary Cupps, Mindi Artherton, Lisa Reid, Dove Haney, Skyler Beebe, Carolyn Bishop, Carolyn Bowen, Landon Fletcher, Donna Hayes Mallams and Joe Cavness. This year’s trivia night will be held on Friday, March 4, at 7 p.m. in the Cassville High School commons area. The event will be a team competition of four rounds of trivia questions with bonus points contests in between. Pizza, desserts and refreshments will be available the night of the event. Teams can register or individuals can join at team the night of the event. The entry fee is $15 per person with a spectator fee of $5 per person. To preregister, contact the Cassville Chamber of Commerce at 504 Main Street or (417) 847-2814.